As we wrote in our last post, women can come to us for some many different reasons. One of our clients shares more today about the ups and downs of her journey. We are so moved by her words and consider ourselves privileged to be with her along the way. In her own words, she explains how Life was there for her. Read on to discover her amazing strength and growth in understanding about her inherent worth. When my life wasn’t completely fitting in to neat lines, when ABC went to X-Y-Z, when I realised that love and hate can be argumentative beasts, I decided to stop beating myself up because I am not the pain I am enduring nor am I less than the trauma that has unfolded. It was time to give myself some love. It started with 11 digits, one sentence and a trained volunteer. were the words I said nearly two years a go. Navigating pregnancy, life, loss and again standing up after trauma has not been easy. If I could tell anyone who was thinking of reaching out, you are more than what you feel is possibly a broken story. At Life you are important, you are whole. Whatever is happening, big or small an ear is there to listen, regardless of the circumstance. and helping to judge myself less. For, despite my days in which I feel weak, I still believe I have come a long way. That hormones and sleep deprivation can be a difficult concoction to manage, but it’s do-able. Thank you for being my cheerleaders, that at times in darkness, it does not have to be concrete or tangible, I don’t have to let my insecurity or at times the feeling of inadequacy rule. Thank you for letting me see that I don’t have to give those emotions any staying power and instead I can bravely let them fuel my actions. Thank you for counting to 10 and back again on those days in which I find difficult. Thank you for laughing with me on the days which are better. Because of 11 digits, volunteers at Life and a lot of compassion I saw the lightness in a dark valley. I was telling myself I was a colossal let down and instead I have realised I am the most beautifully imperfect mother for my children: they have been loved and continue to be loved. In pregnancy, birth, their short life and beyond. 2 years on, today I picked up the phone and heard a familiar voice of the support team. I am still important, I am still listened to, I am valued, I am now my own cheerleader with the support that has been continuous. If you are thinking of reaching out, do so. 11 digits, one sentence, a listening ear and you have a whole new journey. 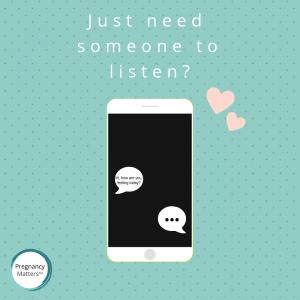 Whatever pregnancy-related issue you might be dealing with, we’re here for you. Leave a comment below to show your support for the wonderful mums we work with.